Is the Arctic about to flip into a new state as a consequence of climate change? It is certainly the first region of the world where climate change has so clearly demonstrated its early impacts. But it is also the place where political transformations have opened the opportunity for leaders and citizens to address economic, social and ecological changes. Such flips are an inevitable potential in any living system. They are rare but dramatic, and potentially transforming. One of the steps that can now be made is to join the international science monitoring effort with a community based one. The Arctic is no different from any system of life. Every living system, at some stage, grows: a baby, a neighborhood, a company, a town, a forest, a grassland, a nation, a global set of biophysical and human processes, During the early phase, growth is dominated by entrepreneurial processes. Early growth in a temperate forest, for example, sees saplings beginning to grow on a landscape during a period when entrepreneurial, pioneer species and physical forces dominate. The system then continues to develop during an intermediate period with more diverse interacting species, leading to a period where a mature forest of a few species emerges that captures and stores the capital that has been accumulated. But also, nearing the culmination of this first phase of growth and accumulation, resilience gradually decreases, new invaders are progressively resisted, and the system becomes locally stable but rigid, less resilient, with little latitude for innovation or for adapting to surprise. For example, the 800 year old trees of the Cathedral Grove in the Vancouver Island temperate rain forest stun the mind and entrance the spirit. But its delights as a mature, temperate rain forest, immense and still, but singing with its small bits, also poise it on a sensitive edge of collapse. Remember the great windstorm of January 1997 that felled a number of giants? As a mature forest, it had become, and the survivors continue to be, an accident waiting to happen. In other forests, the accident might be a fire, a windstorm or an insect or disease outbreak. When collapse is triggered, then reorganization and renewal follows. That is when power lays in the hands of the individual- plant, animal, person or small group. They can launch experiments, some of which can survive to determine the future. This is when resilience expands and where surprise and novelty can suddenly appear. The collapse is a kind of Schumpeterian creative destruction: certainly destructive, but much more interesting, also creative because it releases new opportunity that earlier was smothered. That might lead to the return of the original cycle from the memory of the old established by their seeds and saplings. Or more intriguingly, novelty might emerge as invasive species establish unexpected synergies with native species that fruitfully nucleate a new system, a new cycle. That full cycle is what we call the Adaptive Cycle, one where there is a “front-loop” of growth, followed by a “back loop” of collapse and reorganization (see: Holling, C.S. and Lance H. Gunderson. 2002). 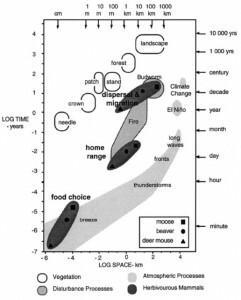 In terrestrial ecological systems, change during the front loop is incremental and learning is gradual and applied. It is essentially predictable. In contrast, during the back loop, disorganization reigns, constraints are removed and probabilistic events can begin to emerge and synergize to nucleate the beginning of a new pathway. That back loop is faster in natural ecological systems than the front loop. It is the time when the individual – species or person- has the greatest potential influence. Learning can be dramatic, but it is chaotic and there are extensive unknowns. The back loop is inherently unpredictable. The front loop is a period of increasing efficiency, the back loop a period of reemerging resilience. Global climate change did that 11,000 years ago, and established the conditions for new biospheres. For example, much of Florida, and I would guess, Cedar Key, where we used to live, earlier was dry oak and grass savannas since so much of the water of the world was still trapped in ice sheets. Shorelines were many kilometers from their present location, and the present Everglades were semi-arid lands. Similarly, the southern edge of the present Boreal Forest was a mixed oak and beech savanna, waiting for the ice sheets to retreat and for the appearance of new species from the south that gradually, in a sequence of adaptive cycles, established the present interacting mix of spruce and fir, jack-pine, alders and birch. 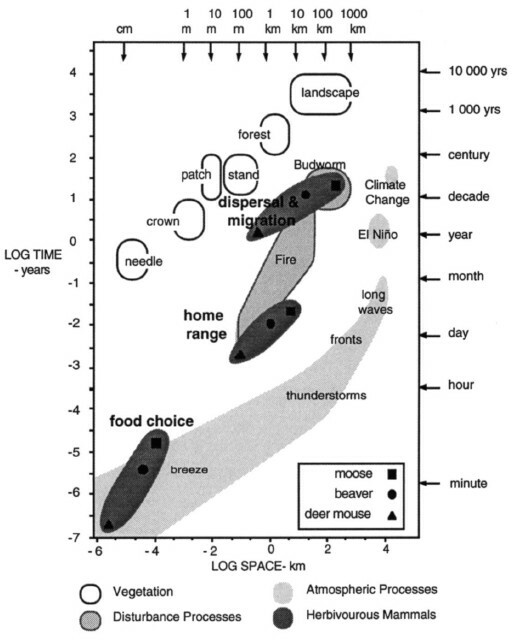 When our view of the scale of a system in space and in time is expanded in this manner, new ranges of scale are perceived where ecosystems become seen as transient assemblages, that for a time- long for people, short for evolving systems- maintain persistent associations of species and local climate, to be ultimately replaced by new conditions that have emerged at a larger scale. Regional or global changes in climate intrude, and ultimately the earlier association breaks down to evolve to another. I have written this to this point inferring an Olympian view from inside the system, where we perceive with equal precision small and big elements, fast and slow ones and all in between. The fast cycling of leaves are perceived as precisely, with as much detail as the very slow millennial scale cycling of bioregions. The first occurs in days and months, and the other in centuries and hundreds of kilometers. But standing outside the full system, in real life, we humans see partial chunks of that full spectrum. We perceive and live in a reduced scale range. Some elements have a speed that are seen and reacted to immediately, some are slower and are seen roughly and periodically. For long periods, as the slow elements on the inside change, that change is invisible to us on the outside. Hence, within our constrained, but swinging rhythm, for long periods we see and act on principally the fast variables. Changes in them dominate our actions, management and policies. Think of the recent financial crisis that precipitated a global surge of surprise and the unknown in 2008/2009. That emerged because our society had slowly evolved a global economy based on a front loop concentration on fast investments through reduced financial regulation and monitoring and on extending globally. Removing controls on an imaginary market was seen as allowing the market to solve any unexpected deviations without explicit attention. Big instabilities could be forgotten. That is as much of a joke of limited economic theory as it is of myopic vision. This focus on fast economic variables led to an emphasis on efficiency but also to the emergence of slowly increasing, hidden forces caused by diversified, subdivided and fragmented investments. No one knew where they were, or what they cost. That eventually triggered a collapse that exposed the reality that slow, invisible changes had decreased the resilience of the world economy. Globalization spread the collapse. What was presumed to be efficient began to be realized as being myopic. Now that process is happening to biophysical elements, not just economic ones. Humans have become a global force by also slowly increasing green house gas emissions, modifying the landscape and transforming the hydrosphere. We are, perhaps, at the beginning of the impact of those slow changes as climate warms because of human influences. Humans have become a global force. We are at the time of a large scale back loop when the individual – species or person- has the greatest potential influence. It is the global time when small is beautiful and local experiment most useful. Learning is chaotic and there are extensive unknowns. The back loop, recall, is inherently unpredictable. That is particularly evident in the Arctic now as we see the floating ice sheets dramatically contract and glaciers melt. Over the past decade, radar satellite imagery shows that the ice sheets on the Arctic Ocean have shrunk to 2/3 of their original extent and thickness. It is simply astonishing that the thickness can be measured within a few centimeters from space! The image of change described earlier shows adaptive cycles arranged in structures across scales. This equally applies to a different set of ecological and physical processes at the top of the world, in the Arctic region. In one orientation of a map of the top of the world, sitting on the pole, scanning the world above the Arctic Circle, we see Alaska at the top left, Canada on the left side, Greenland and Iceland on left bottom, Norway, Sweden, and Finland on the right bottom and Russia sprawling throughout the right side to the top. Those nations represent the Arctic Council of eight nations. This is indeed a view from the top of the world. The Arctic Ocean dominates the center of the map, while Northern Alaska, the Canadian Arctic archipelago and Greenland fringe the left side. This is the region where the North West Passage was imagined in its alternate routes. This is a region, at smaller scales, of ocean passages, changing ocean currents, productive biotic hotspots, and Inuit communities with polar bears, beluga whales, seals and Arctic fox both at the top of the world and the top of the food network or chain. Even the subsurface topography is only crudely known as are the biotic interactions and the water chemistry. The Beaufort Sea is now freshening as melt water creates the largest collection of fresh water in the world. The area is the focus of the International Polar Year (IPY) and, more specifically of Canada’s contribution: The Canada’s Three Oceans (C3O) project, led by Eddy Carmac (Carmac and Mclaughlin. 2011). That project is dedicated to monitoring the Arctic from the northern Pacific through the Arctic into the northern Atlantic. Physical, chemical and biological attributes are sampled along a trajectory that can ultimately reveal, when repeated, the changes that occur as regional temperature increases. Melting of floating ice sheets, increases in water acidity, and hints of impacts on some species in the trophic network are already evident. The most obvious hints come from speculation concerning polar bears as they hunt for food on diminishing ice sheets. But there are also hints from suspicions about planktonic species. Fish resources are likely to respond, and the knowledge needed to mange them is weak. These observations reinforce the steps now underway to collect the kind of data, test speculations and develop models that are essential as change progresses on the top of the world. The possibility of flips of ecological systems is very real, with surprises emerging that will have positive and negative consequences from a human perspective. There are existing examples on land as permafrost melts; more will appear in the oceans. The economic consequences for access to new fossil fuel sources and for ship movement through the Arctic are increasingly raising social, ecological and political issues that challenge and invite a cooperative regime of governance among the nations of the north. Perhaps Norway’s experience as one of the eight Arctic nations can help. They have dealt with their own oil development in a way that recognizes present and future social needs. Perhaps those lessons are transferable to other Arctic nations. At the moment, however, individual nations tend to launch competitive national initiatives to establish sovereignty, in preparation for international negotiations. These clear changes in the impacts of climate change suggest a need to expand national efforts to moderate climate change from present international steps limiting greenhouse gas emissions, to new regional steps to adapt to existing and expected effects of changes in climate (for example, see Visbeck, 2008). Active Adaptive Management then becomes a priority, and the north the place to initiate and test the steps. Scientists, stakeholders and citizens are an integral part of the approach that has evolved. In the Arctic new scientific, social and political forces can combine for mutual benefit as an initiative leading to international action. The polar program is therefore more than natural science. It is politics, history and social science as well. Preeminently, the Inuit will be profoundly affected. Historically, it is hard to imagine a more adaptive culture than that of the Inuit who lived on ice and land in the Arctic, prior to the appearance of Europeans. The Inuit and others hunted and lived over 4 000 years in ecological edges and hotspots, shifting away when climate became colder, back again when it got warmer. Throughout, they adapted inventively for blunt survival. The appearance of Europeans launched one transformation of these societies. Conversation now with those who live in and know the north feature telling stories of the isolating, shattering Residential Schools, of forced movement of Inuit groups torn from northern Quebec forests to Arctic deserts. The Churches, RCMP, and the government were blind, locked in their own paradigm of conquest and dominance. These are examples from our past that now are seen as representing beautifully intentioned narrowness and overwhelming ignorance (McGrath 2008). Since then, the Inuit have experienced both crises and opportunities whose effects are barely grasped as settlements increasingly detach people and parts of their culture from the land and seascape. The Arctic is now on the edge of a new sudden flip into a new regime caused by climatic, global economic and social causes. The Inuit’s adaptive capacity is one element that could help invent elements for the transition. Recent changes in political structures in northern Canada, Alaska and in Greenland open the opportunities. In addition, the best of integrative science at the scales now examined in Polar Studies is the other. Extending the work of the International Polar Year and of the Three Canadian Oceans’ Project is therefore a prime opportunity. A fundamental step for that extension is to join a new social initiative with existing scientific ones. That could be done in a program that developed a consortium of local communities to monitor the physical, biological and social changes on land and at sea, using small vessels or snow machines owned by each community. An early example of such a program is provided by Carmack and Macdonald (2008) who describe examples of indigenous knowledge and western science combining to give deeper insight than either alone. That local monitoring can combine to provide data and understanding at a next larger scale. And that in turn would combine with the IPY and 3CO programs for a full Arctic and costal assessment. The Panarchy would be bridged and its different speeds perceived. People would combine their talents, different experiences and histories as a stage for policy responses globally and regionally and for living locally. That sounds nice, but how will we get people from eight different nations to cooperate, and have their governments act accordingly and not with selfish greed for resources? Such an initiative would have its own local economic benefit as residents used their community vessel for other activities as well. It would, for example, connect to the existing Canadian Rangers program, an existing network of local peoples with extraordinary skills in living on the land. There is deep knowledge of ecosystems and environment in every community of the Arctic and of the Pacific coast, knowledge drawn from the history and present experiences of the Inuit and First Nations. This new project would open a new direction to build on the deep identities indigenous peoples have slowly evolved in their earlier worlds. It could begin small and expand as naturally appropriate. Imagine the potential for the Inuit kid or the young Haida native to develop the knowledge that can link his elders knowledge, with modern science, and economically viable harvesting, across scales. A member of a true regional and global citizenship, who could recapture a disappearing identity. Carmack, Eddy and Robie Macdonald. 2008. Water and ice-related phenomena in the Costal Region of the Beaufort Sea: Some parallels between native experience and western science. Arctic 61(3): 1-16. Gunderson, L.H and Holling, C.S (eds) Panarchy: Understanding transformations in Human and Natural Systems . Island Press, Washington and London. Holling, C. S., L.H. Gunderson and G.D. Peterson. 2002. Sustainability and Panarchies. In. Gunderson, L.H and Holling, C.S (eds) Panarchy: Understanding transformations in Human and Natural Systems . Island Press, Washington and London, Chapter 3, 63-102. McGrath, M. 2006. The Long Exile. Alfred A. Knopf, Nerw York, 268 pp.